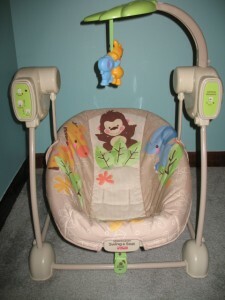 A swing is a must have item for all newborns, and small portable ones can be used for so many things. I honestly don’t know what we would have done without ours. It was one of the most useful baby shower gifts that we received. One of the main ways we used our portable swing was as a bed. We had set a beautiful cradle up in our bedroom for Nick to sleep in, but he wanted nothing to do with it. The portable swing was our only other option if we wanted Nick to sleep in our room, and he was more than happy with the arrangement. As long as he was swaddled and had his Sleep Sheep attached to the swing and playing he was a happy guy. A bonus with the portable swings is that they truly are portable. We were able to carry the swing to different rooms so Nick could sleep by us no matter where we were. Also if you have to travel somewhere you can take the swing with you. This never affected us, but I’ve know other that have travelled with a swing. Travel can be hard on a baby, but I’m sure that having their own swing makes it easier for them to deal with. Another way we used the swing was as a seat. Our specific swing is the Fisher Price Precious Planet Space Saver Swing and Seat, and it can be turned into a stationary seat. It was wonderful during the first few months when we wanted Nick by us but had no where to put him. This was especially helpful on nights when Jason was gone and I needed a place to put Nick while I took a bath. When Nick turned 4 months we found another use for the portable swing. It was the perfect seat for Nick to sit in while starting his first foods. 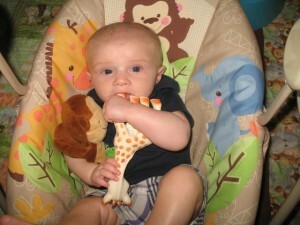 We didn’t yet have a high chair when Nick started solids, but at that point he wasn’t able to sit up in one anyway. The angle of the swing was perfect for a beginning eater. The only problem with this use was that it required us to sit on the floor to feed him. Now that Nick is older he sleeps in his crib and eats in his high chair. I had decided that it was time to put the portable swing away. My plan had been to put it away over the past weekend, but I hadn’t gotten around to it. It turned out to be a good thing I hadn’t because on Sunday night Nick came down with a bad head cold and he was so congested that he couldn’t breathe if he was laying flat. We knew he needed to be propped up, so for the last few nights he’s been sleeping in his swing again in our room. Since I have only owned one portable swing I can’t say what features they all have, but these are the features of our Fisher Price Precious Planet Space Saver Swing and Seat. It can be used as a stationary seat or as a swing. There are 5 different swing speeds. It has a 5 point harness. It plays a collection of songs (it lasts about 5 minutes) and there are two volume levels. There is an overhead bar with a dangling toy. The bar swivels to allow easy access to the baby. The swing also has a calming vibration setting. As much as I love our portable swing, and I highly recommend it, it does have a few features that I don’t like so much. The biggest problem, and it is shared by all portable swings, is that the swing ends up costing so much more than the original price because it eats up batteries. Our swing requires two D batteries to run the calming vibrations and four C batteries for the swinging motion and the music. The other problems are really just nit picky things. First I love the music that Nick’s swing plays, but it’s all upbeat so we had to attach his Sleep Sheep to create soothing sleep sounds. The only other little problem I have is with the toy bar. It is high up, and a bit far back, so Nick never played with it until he was about 4 months old (when he only used the swing for eating). Portable swings may have a few flaws, but I feel they are an important baby item. If you have to choose between a portable swing and a big swing I say go with the portable one. The big swing is great, but the portable swing has more uses and you can’t beat the convenience of being able to move it around. Plus it takes up far less space. Which portable swing would you recommend and why?